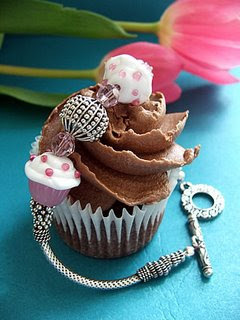 My Cupcake Elegance lampwork bracelet was featured on the Cupcake Queen's blog, 52 Cupcakes. The photos she took are beautiful! That is a real chocolate cupcake from Whole Foods. I keep my jewelry photos very simple, but not anymore! Linda has inspired me to be much more creative with props from now on. This bracelet is a made to order item, so turnaround is about 2 weeks. Just let me know your wrist size when ordering at www.RockerJewlz.Etsy.com. For my paper goods shop, www.MomsArt.etsy.com, I'm awaiting a delivery of a zillion sheets of colored paper so I can punch sweet little birdfetti which will be on the site by the weekend. A little birdie in flight will be so cute in a variety of colors. Two friends are breathlessly waiting already. My studio is getting more organized. With life getting in the way it took 2 weeks to assemble four units with lots of little drawers. I'm now in the fill-up-the-drawer stage, which like my friend Whit-Knee said, is more fun than I expected. I'll have some photos soon of the before and after...we'll skip the "during" if you don't mind. You'll be glad I did.